It was a simple and compelling idea, the creation of a strong economic union, free of internal trade restrictions. It was so convincing, the framers of the constitution unequivocally penned section 121 of the Constitution Act; All Articles of the Growth, Produce, or Manufacture of any one of the Provinces shall, from and after the Union, be admitted free into each of the other Provinces. It was a good idea, unfortunately torpedoed after The Great War. There have always been parochial interests fighting free trade and it was during the height of the prohibition era the Supreme Court of Canada (SCOC) jumped in and gelded section 121. As the story goes, the Canada Temperance Act (CTA) governing the sale of liquor finally came into force in Alberta in January of 1921. In February of that year, Gold Seal, a liquor retailer in Alberta, asked Dominion Express to deliver liquor to some customers outside of Alberta. Dominion Express refused because it felt that to do so would violate the federal CTA. So began Gold Seal Ltd. v. Alberta (Attorney General) which eventually made its way to the high court. With the Gold Seal decision, the SCOC’s interpretation of section 121 limited its application to prohibiting only inter-provincial “customs duties”. 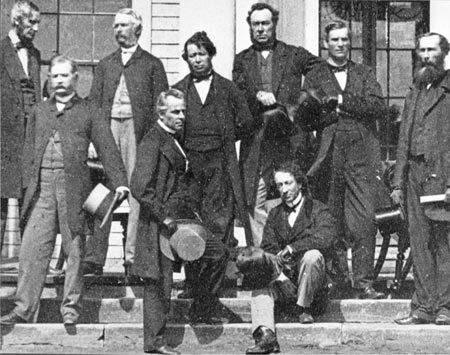 The interpretation conveniently ignored that no inter-provincial customs duties had ever been imposed in the history of Canada and, for what some have advanced were political reasons, the SCOC kicked section 121 and intention of the Fathers of Confederation to the curb. Since then, successive politicians, courts, government officials, special interests and political constituencies have used the Court’s interpretation of section 121 to successfully create trade schemes and regulation on everything from eggs, wheat and coffee creamers to truck parts and, of course, liquor. Fast forward 150 years from Confederation and the importance of internal free-trade is once again a priority. International trade agreements, i.e. the Comprehensive Economic and Trade Agreement with Europe (CETA) and the Trans-Pacific Partnership (TPP), create more urgency to cut the Gordian knots of red tape between our provincial borders. Why? Because foreign companies may now have access to opportunities in Canada that companies in a neighbouring province or territory may not. Inter-provincial squabbling continue to undermine our economic competitiveness. CFIB released a report in 2014 showing that small- and medium-size businesses want internal free trade to be a top priority. According to Transforming Trade, 87 per cent of small businesses said the premiers need to reduce trade barriers between provinces. Nearly one-third of business owners surveyed experience conflicting rules and regulations when trying to move goods or workers between provinces. Regionally, provincial governments seem to be getting the message and we are seeing steady progress. One example is the Premiers signing the Provincial-Territorial Apprentice Mobility Protocol. This new measure notably follows the principle of “mutual recognition”. Rather than a lengthy bureaucratic process of harmonizing each and every regulation across each jurisdiction, the Premiers said “if it’s good enough in Province A, it’s good enough for Province B.” While God is in the detail, this is the gold standard for modern day trade agreements and is precisely the direction we want our provincial governments to go when removing barriers. CFIB applauds the decision of the Council of Atlantic Premiers to create the Atlantic Red Tape Reduction Partnership to align business requirements throughout the region. This eventually grew into Premiers Gallant and McNeil, taking the step of creating the Joint Office of Regulatory and Service Effectiveness to streamline regulation between New Brunswick and Nova Scotia. Today’s announcement of PEI joining with New Brunswick and Nova Scotia to work on red tape reduction demonstrates significant willingness on behalf of all three governments to tackle this issue. CFIB is very encouraged to see all three provinces adopting common regulatory principles. One framework to look at regulatory reform, one regional approach to regulation, making regulation a last resort rather than a first resort are all exceptional strides forward. The fact that all three Atlantic Provinces will adopt a common system of measurement and reporting will not only give each province the ability to assess the costs of regulation they will be they will also be able to track red tape reduction regionally. We’re very pleased each province will bring forward legislation committing to publicly report their progress. CFIB is very pleased to be working together with other business organizations across the region to assist the Partnership in recommending both important structural changes and specific actions to eliminate red tape between provinces. While we wait around for the federal government to exert some constitutional authority, we are also encouraging all four Atlantic governments to table legislation committing to setting targets, measuring success and reporting publicly on these red tape reduction efforts. Atlantic Canada is facing serious economic challenges. With the world of trade changing around us it’s becoming increasingly important we work together to break down barriers between our provinces to make the best possible use of our economic and human resources. As the country has now shifted to a Liberal government, who knows, maybe a reminder from the Grit’s founder, George Brown, is very timely.